mystical snow covered Minenohara Kogen hights. Fukunaga including wine tasting, dinner and breakfast. Minenohara Kogen Ski Resort has been renewed this season. Why don’t you experience a mystical snow covered scenery ? Mirai Shopping. They are Special Cuvée Series. in barrel or bottle. Some small but others quite big. of various efforts. A sweet surprise! We are happy to introduce such surprising wines this time. we were not able to release it because of the astringency. flavor in a big burgundy glass. How interesting it was ! to visit our winery and commented very favorably on this Pinot Noir. The wine has now become ready for tasting after 8 yeas of time. It is really a special wine. Please try it with big burgundy glass. 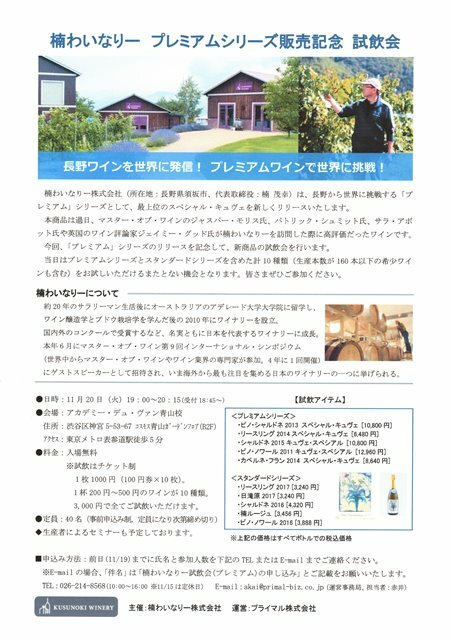 specialized in wine with Nikkei Mirai Shopping. Admission: 7,000yen per person limited to first 30 registered only. It is a late lunch event with Kusunoki wines and savory food. Come with empty stomach. Relax and enjoy the beautiful wines.